In addition to their roles as educational institutions structuring human capital development during a critical period of socioeconomic attainment, high schools organize the peer contexts in which young people come of age during a critical period of development. Consequently, understanding the peer processes that characterize the social contexts of schools sheds light on how schools are operating as formal institutions of teaching and learning. 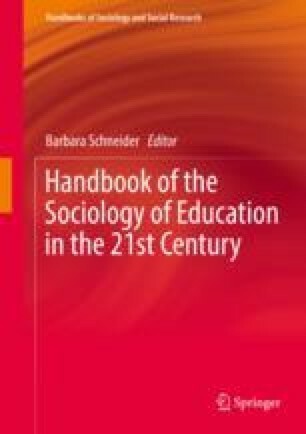 This chapter provides an overview of research from sociologists of education and scholars in other disciplines about the social contexts of high schools and their relevance to curricula, achievement, and other formal processes of schooling. After using three key books in this field to trace the historical evolution of thinking about the social contexts of high schools, we describe key components of these contexts (peer networks, peer crowds, school climate) and then discuss the value of greater attention to them in educational policy and practice.